We have some big news coming out of SoCal for spring 2016, and fans of Mr. Roland Sands’ apparel division should be very excited. Roland Sands Design just released a new pair of Dalton Jeans and cafe-styled Mojave Boots to take on the existing offerings. It goes without saying that this gear will look great and complement the RSD jacket already hanging in your closet, but let’s dive into some details. Starting off with the Roland Sands Dalton Jeans, we have a very understated dark indigo wash denim which is interwoven with Kevlar for abrasion resistance. The look RSD is going for is a low waist, slim fitting jean with no flair around the boots, so these would definitely be jeans that would be tucked into some high lace-up boots. The good thing about these jeans is that RSD chose to keep it simple with no crazy designs, stitching, or swirls, and a classic five pocket style. So, if you’re the type of rider that just deals with regular jeans because riding jeans look too technical, you are now covered! On the other hand though, those riders looking for a super technical riding pant with armor pockets should look elsewhere. The other big release for 2016 are the Roland Sands Mojave Boots. 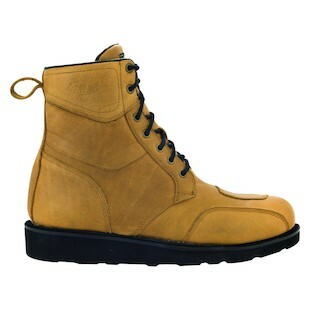 Starting from the outside, the upper is made from top grain, drum dyed cowhide. There is composite toe, ankle and heel support, with a composite shank running through the sole. The insole is removable, making this boot friendly with aftermarket inserts, and the flat bottom sole is made by Vibram, which we are seeing used more and more often these days. The finishing touches are also super high quality, with brass eyelets and waxed laces, and double layers of leather in the high wear layers. The last piece of big news is that the Mojave boots are using Hipora waterproofing with a full gusset up to the top eyelet. In short, the Mojave boots just ooze character, offer a cafe-style boot that is beefy, durable, and waterproof, and come in four color options to match any style. In short, color us pleasantly surprised by Roland Sands Design’s Spring 2016 launch. We were expecting their usual update of new jackets, and we’re really happy to see them going after some of the more established denim and boots brands. Competition only strengthens the breed, and seeing what Roland Sands did for the jacket market, we’re excited to see what they can do here.